If you're one of the lucky ones who has a gorgeous new ZL1 sitting in your garage, I've got one of the first must-own mods for you. The Mild to Wild Exhaust On Demand Controller for the Camaro ZL1 and NPP Outfitted Camaro SS provides user control over the exhaust's bi-modal functionality to the driver. Stock, the Bi-Modal system opens and closes its valves based on RPM numbers and driver aggressiveness, which means that sometimes the exhaust tone is choked down when you might not want for it to be. By installing a Mild to Wild fuse control, you'll gain complete control over when those valves are open, and your exhaust system is at a full roar. This is great for starting the vehicle up at car shows and drive-ins, and for driving on a nice weekend day when you want to hear the full beauty of the vehicle's capable exhaust notes. The Mild2Wild Camaro ZL1 Wireless Exhaust Controller is the only FCC approved exhaust controller and works on all Camaro ZL1’s and NPP outfitted 2013 and newer Camaro SS's. Developed with the help of GM engineers, the Mild2Wild Remote Exhaust control allows you to be in total control of your exhaust system allowing you to unleash the bi-mode exhaust at any time, so you can have full sound & power, even at idle! You will think you installed a new exhaust system, with the deep rich sound at any RPM it provides--just like it should be. A key feature on the Camaro ZL1 is that you can even program you homelink universal garage opener to control the exhaust (so while driving opening and closing the exhaust is just a button press away) and still have the wireless remotes so you can show off the exhaust to your friends while standing in the back of the car with just a touch of a button on the mini wireless fobs, 5 minute plug and play. Operation: Once installed, you will have 2 settings, “ON” factory operation, exhaust will operate as it did prior to installing mild2wild. “OFF” The system will remain 100% open until you close it with a press of you homelink buttons. Comes with 2 remote controllers. Instructions included. 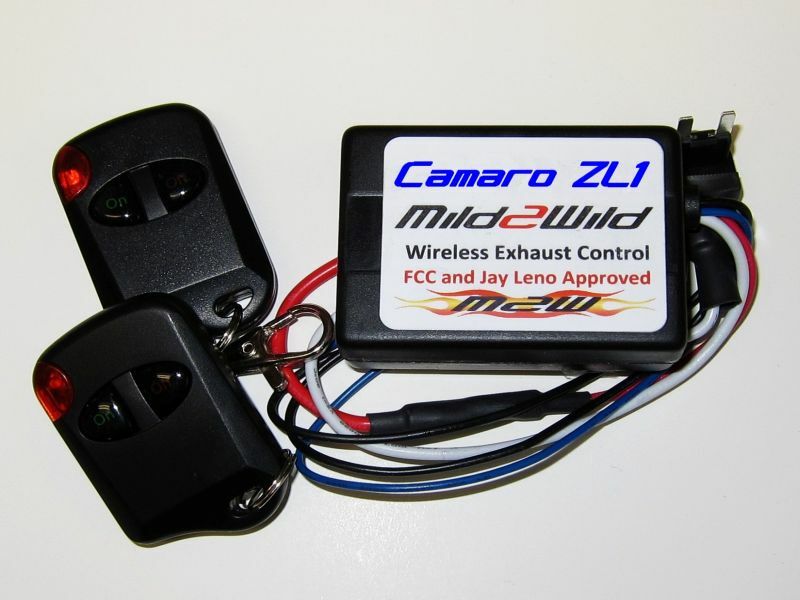 •	The Mild2Wild Camaro ZL1 Wireless Exhaust Controller is the only FCC approved exhaust controller and works on all Camaro ZL1’s, developed with the help of GM engineers. •	The only controller certified by the Corvette museum and was installed on museum delivery C6's. Swing by our website and check out the Camaro Mild to Wild Exhaust Controller page for more video and images. Please feel free to ask us any questions about this exhaust controller that you may have, also. Last edited by southerncarparts; 10-21-2015 at 08:12 AM. And it includes free shipping to the lower 48 right now. Just got a 2014 1LE with NPP exhaust delivered. Definitely going to buy one of these from you. I am in Florida so should get it quick! • The Mild2Wild Camaro ZL1 Wireless Exhaust Controller is the only FCC approved exhaust controller and works on all Camaro ZL1’s, developed with the help of GM engineers. As the Mild2Wild device is not compatible with the C7 Corvette, please explain how it is that the Corvette Museum installs the device on new Museum Delivered cars ??? We've got a live one! Just old copy from the C6 days, I'll edit that out.